" I put my heart and my soul into my work, and have lost my mind in the process." The ability to create is one of the outstanding traits of human beings. From harnessing fire to splitting the atom, an inexhaustible stream of innovative flashes has largely driven our social development. Significant insight into the neuronal mechanisms underlying the creative thought process is coming from work with patients who have suddenly acquired unusual skills as a result of brain damage. Using technical advances such as functional magnetic resonance imaging and electroencephalography, neuroscientists are trying to determine just where those sparks originate. Neurologist Bruce L. Miller, clinical director of the Memory and Aging Center at the University of California at San Francisco, was astonished to find talent blooming in the brains of a people whose mental functions were deteriorating because of crumbling neurons. Miller has identified men and women whose latent creativity burst forth as frontotemporal dementia set in - even in patients who had little prior interest in artistic pursuits. One man, a stockbroker who had never before been touched by the muse, traded his conservative suits for the most radical styles he could find. He developed a passion for painting and went on to win several art prizes. Another person began to compose music even though he had no musical training. A third invented a sophisticated chemical detector at a stage when he could recall only one in 15 words on a memory test. The ease with which we routinely string together appropriate words during a conversation should leave no doubt that our brains are fundamentally creative. What scientists are trying to discover is why the engine of inspiration seems to be always in high gear in some people while others struggle. Intelligence is not a crucial ingredient. U.S. military leaders recognized this seeming contra-diction more than 50 years ago. During World War II, the U.S. Air Force sought to identify fighter pilots who would be able to get out of jams in unorthodox ways. Officials wanted pilots who would not simply bail out in an emergency but who would be more likely to save themselves and their aircraft. Initially, military scouts used conventional intelligence tests to identify such candidates. But they soon realized a high IQ was useless in finding inventive super pilots, and they resorted to more anecdotal measures. Around the same time, psychologist Joy Paul Guilford of the University of Southern California noted that intelligence did not mirror the totality of a person's cognitive capacity. In the late 1940s Guilford developed a model of human intellect that formed the basis for modern research into creativity. A crucial variable is the difference between “convergent” and “divergent” thinking. Convergent thinking aims for a single, correct solution to a problem. When presented with a situation, we use logic to find an orthodox solution and to determine if it is unambiguously right or wrong. IQ tests primarily involve convergent thinking. But creative people can free themselves from conventional thought patterns and follow new pathways to unusual or distantly associated answers. This ability is known as divergent thinking, which generates many possible solutions. In solving a problem, an individual proceeds from different starting points and changes direction as required, which Guilford explained leads to multiple solutions, all of which could be correct and appropriate. Guilford tried to find a measurable “creativity quotient” analogous to IQ, but his efforts and those of other researchers since his time have all failed. A few techniques, such as the Torrance Test of Creative Thinking, can give a sense of which people in a test group may be more creative. But deciding which of their many responses can be characterized as especially creative is simply too dependent on the personal judgment of the tester. Ideational fluency. The number of ideas, sentences and associations a person can think of when presented with a word. Variety and flexibility. The diversity of different solutions a person can find when asked to explore the possible uses of, say, a newspaper or a paper clip. Originality. The ability to develop potential solutions other people do not reach. Elaboration. The skill to formulate an idea, expand on it, then work it into a concrete solution. Problem sensitivity. The ability to recognize the central challenge within a task, as well as the difficulties associated with it. Redefinition. The capacity to view a known problem in a completely different light. Wonderment. Try to retain a spirit of discovery, a childlike curiosity about the world. Question understandings that others consider obvious. Motivation. As soon as a spark of interest arises in something, follow it. Relaxation. Take the time to daydream and ponder, because that is often when the best ideas arise. Look for ways to relax and consciously put them into practice. The right hemisphere's divergent thinking underlies our ability to be creative. Curiosity, love of experimentation, playfulness, risk taking, mental flexibility, metaphorical thinking, aesthetics - all these qualities play a central role. But why does creativity remain so elusive? Everyone has a right hemisphere, so we all should be fountains of unorthodox ideas. 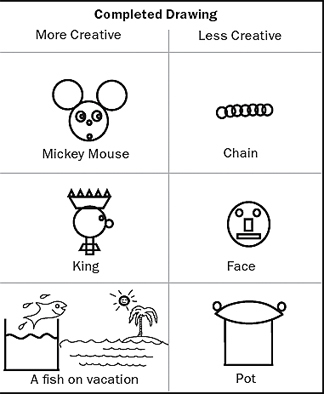 In a standardized Torrance Test of Creative Thinking, subjects are given simple shapes (left column) and are asked to use them (top row) or combine them (middle row) in a picture or to complete a partial picture (bottom row). Evaluators judge whether the results are more or less creative. To see Lorne's try at the Torrance test, click here. The creative person wants to be a know-it-all. He wants to know about all kinds of things: ancient history, nineteenth century mathematics, current manufacturing techniques, flower arranging and hot dog futures. He never knows when these ideas might come together to form a new idea. It may happen six minutes later or six years down the road. But the creative person has faith that it will happen. Knowledge is the stuff from which new ideas are made. Nonetheless, knowledge alone won't make a person creative. The real key to being creative lies in what you do with your knowledge. Creative thinking requires an outlook that allows you to search for ideas and play with your knowledge and experience. With this outlook, you try different approaches, first one, then another, often not getting anywhere. You use crazy, foolish and practical ideas as stepping-stones to practical new ideas. You break the rules occasionally, and explore for ideas in unusual outside places. And, in the end, your creative outlook enables you to come up with new ideas. The first is Johann Gutenberg. What Gutenberg did was to combine two previously unconnected ideas: the wine press and the coin punch. The purpose of the coin punch was to leave an image on a small area such as a gold coin. The function of the wine press was, and still is, to squeeze the juice out of grapes. One day, Gutenberg, perhaps after he'd drunk a goblet of wine, asked himself, "What if I took a bunch of these coin punches and put them under the force of the wine press so that they left their image on paper?" The resulting combination was the printing press and moveable type. Navy Commander Grace Hopper had the task of explaining the meaning of a "nanosecond" to some non-technical computer users. She wondered: "How can I get them to understand the brevity of a nanosecond? Why not look at it as a space problem rather than a time problem? I'll just use the distance light travels in one billionth of a second." She pulled out a piece of string 11.8 inches long and told her visitors, "Here is one nanosecond." In 1792, the musicians of Franz Joseph Haydn's orchestra were mad because the Duke had promised them a vacation, but continually had postponed it. They asked Haydn to talk to the Duke about getting some time off. Haydn thought for a bit, and decided to let music do the talking, and wrote the "Farewell Symphony." The performance began with full orchestra, but as the piece goes along, it is scored to need fewer and fewer instruments. As each musician finished his part, he blew out his candle and left the stage. They did this, one by one, until the stage was empty. The Duke got the message and gave them a vacation. One day Pablo Picasso went outside his house and found and old bicycle. He looked at it for a little bit and took off the seat and the handle bars. Then he welded them together to create the head of a bull. Each of these examples illustrates the creative mind's power to transform one thing into another. By changing perspective and playing with our knowledge, we can make the ordinary extraordinary. In this way, wine presses squeeze out information, string is transformed into nanoseconds, labor grievances become symphonies, and bicycle seats turn into bulls' heads. The Muses are the Greek goddesses who job is to inspire artists and those involved in the arts. Daughters of Zeus and Mnemosyne ("memory"), each of the sisters (Clio, Erato, Thalia, Terpsichore, Calliope, Polyhymnia, Euterpe, Melpomene, and Urania), is responsible for a different art. In ancient Greece, before poets or storytellers recited their work, it was customary for them to invoke the inspiration and protection of the Muses.